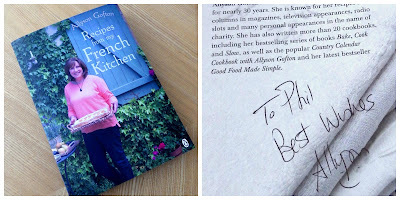 I've been reading Allyson Gofton's ‘Recipes from my French Kitchen’ and it's been pleasantly nostalgic for me because it talks enthusiastically of foods and places that I've loved in the south west of France. It's also a bit odd because it's clearly aimed at an audience back home in New Zealand and New Zealand is much more of a mystery to me than France. How I came to be the owner of a signed copy of a book of French recipes written by a cook from New Zealand whom I've never met is just too long a story. As far as I know, the book hasn't been published in the UK. I was reminded of many places and tastes but one in particular stood out. In the local markets and bakeries, especially as you start to get into the Pyrenees, you're pretty sure to come across a brioche-shaped cake called either a ‘pastis’ or a ‘tourte’ or maybe a ‘croustade’. It's a cake that I'd always intended to make but that I'd never quite got round to attempting and this book persuaded me to get on and do it. To me the tourte resembles a sort of Madeira cake that you can enjoy up a French mountain. It's a simple recipe that's often flavoured with vanilla or booze such as rum or pastis (the drink) and sometimes contains extras such as blueberries. Of course, the blueberries should be wild and foraged from the mountainside but I foraged for mine in the supermarket on the High Street. The three different names for essentially the same cake are pretty confusing but here's my highly questionable interpretation just in case you're interested. It was probably called ‘tourte’ because that word was often attached to special occasion (especially birthday) cakes or pastries. The name ‘croustade’ possibly came about because it does have a sort of Madeira cake style light crust. The word ‘pastis’ probably has nothing to do with the famous aniseed drink, although the cakes can be flavoured with the drink and some say the drink got the name from being used to flavour the cake. The word ‘pastis’ actually seems to derive from an ancient Gascon word for dough or batter and, by extension, cake. If you happen to find yourself among the pine trees of the département des Landes, then pretty much the same cake will probably be called a pastis and, as likely as not, will be flavoured with orange. Now that’s as much dubious food history as I can cope with while sober. There are many different ways of producing this sort of simple cake and this isn't actually Allyson Gofton's recipe (not that there's anything wrong with it). My version is based on an amalgamation of recipes from the area that I've collected over time. This cake looks the part if made in a fluted brioche tin, although a simple round tin will do just fine. The one I use has a diameter of 20 cm (at its widest) and a capacity of around 1.25 litres. If it's a non-stick tin, then so much the better, but I think it's still best if it's buttered thoroughly. (If you see this cake being sold at a French market, there's a good chance that they'll be in paper liners which could save on the buttering business, but the liners are not widely available in this country). Preheat the oven to 160ºC. Separate the eggs. Whisk the yolks and the caster sugar together until the mixture is very pale. Add the melted and cooled butter, the rum, vanilla and milk and whisk in. Sieve the flours and baking powder together and add to the mixture. Stir in thoroughly. (If the mixture seems very stiff, then add a little more milk). Stir in the blueberries. In a separate bowl, whisk the egg whites until they form stiff peaks. Stir a large spoonful of the egg white into the cake mixture to loosen it a little, then fold in the rest of the egg whites gently but thoroughly. Pour into the tin and sprinkle the top with pearl (nibbed) sugar if you have any. Bake in the preheated oven for 45 - 60 minutes. Test with a knife or skewer in the usual way. Allow the cake to cool in the tin for about 15 minutes before removing and cooling completely on a rack. You really don't have to be up a mountain or in New Zealand to enjoy this.